Over the last decade the site of Ek Balam has emerged as one of the great surprises in Maya archaeology. A relatively small site, although possessing sizeable mounds, excavations in Ek Balam’s Acropolis have revealed one of the best preserved stucco facades in Mesoamerica. Arranged around a doorway in the shape of a gigantic serpent’s mouth, nearly life-sized stucco figures were excavated in nearly pristine condition, having been carefully buried by the ancient Maya about 1200 years ago. The reason for the elaborate precautions taken by the builders to preserve this facade were revealed when archaeologists entered the inner chamber of this structure and found a royal tomb. Surrounded by ceramic vessels, once stocked with funerary offerings of food and drink for the deceased, lay the body of Ukit Kan Le’k Tok’. Inscriptions from across the site have now confirmed that he was both the first and the greatest king of Ek Balam, having come to the throne in 770 and dying around 800. During the thirty years of his reign Ek Balam became the greatest power in northeastern Yucatan, superseding Coba, the enormous site to the southeast. 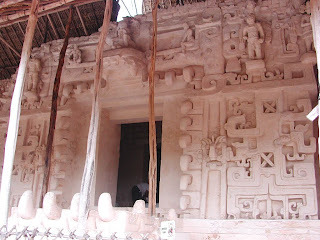 Many structures were built at Ek Balam during his reign, and Ukit Kan Le’k is even mentioned in the inscriptions of Ichmul, a site 25 km to the west. A painted capstone from the room just inside the elaborately decorated facade that framed the entrance to his tomb inform us that the name of this structure was the Sak Xok Naah, that may read “White House of Reading”. Within his tomb many inscriptions named the dead king, and one remarkable find was a carved human femur, clutched in the hands of the deceased. A hieroglyphic inscription on this bone indicated that it was the bone of a man who was named Ukit Ahkan, possibly the father of Ukit Kan Le’k. There was a tradition amongst the ancient Maya of retrieving the bones of their ancestors to use in rituals designed to commune with the dead. The bone held by Ukit Kan Le’k in his tomb had one end filed down into a point, possibly to be used in bloodletting rites. Other objects buried with Ukit Kan Le’k included a necklace made out of small shells carved in the shape of skulls, as well as pearls and most remarkably, a small frog made out of gold. Gold is all but completely unknown from the Classic Maya world, and this piece was clearly an import from Panama given its style, indicating the extensive trade networks of which Ukit Kan Le’k was a part. What may be the most interesting find in the tomb, however, was a painted capstone found above the burial. On it, Ukit Kan Le’k is portrayed in the guise of the Maize God, the deity of resurrection and rebirth who represented the cycle of life and death in the cornfield that was the center of traditional Maya life. This painting is unique, however, in portraying this king/god with a split upper lip. Osteological examination of the bones found in the tomb revealed that Ukit Kan Le’k had suffered from a bone disease on his maxillary area, suggesting that in life he would have indeed had an oddly shaped upper lip. While most Maya kings were portrayed in an idealized manner, the artists of Ek Balam saw it fit to portray their king as an individual, allowing us over a thousand years later a unique glimpse into the reality of life as a Maya king.